Clingstone peaches: Difficult to pit and peel, blanching required for peeling and skilled knife work needed for pitting. This recipe uses about 8 medium-sized peaches. 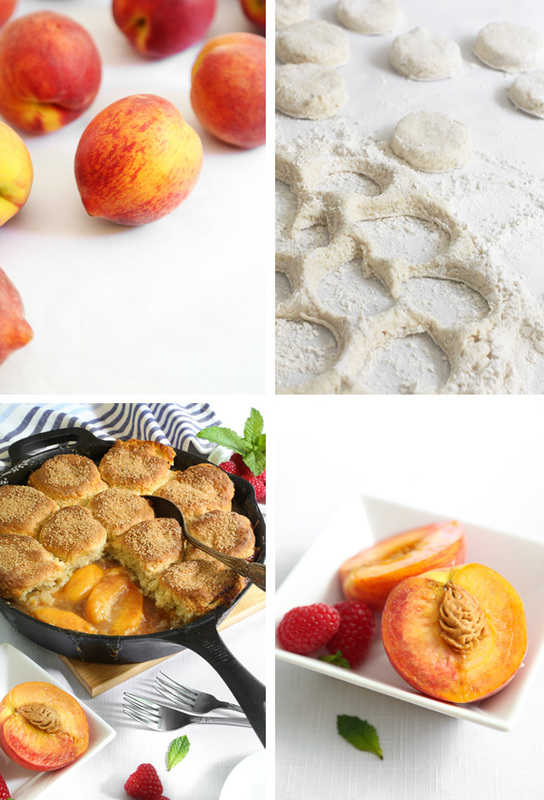 It's important that you choose peaches that firm but ripe because over-ripe peaches will lose their shape and turn to mush in the hot skillet (it'll still taste good, though!). If you don't have a cast iron skillet then you can make this in a 13x9-inch dish. If you don't have a 10-inch cast iron skillet, this recipe can be baked in a 13x9-inch dish. Turbinado sugar is coarse and gives the biscuits a glittering, crunchy crust. You can find it at most grocery stores in the baking section. Place the peaches in a large bowl and add the lemon juice; toss to coat. Stir in the wildflower honey and granulated sugar. Let the peaches stand at room temperature until they give off their juices (called ‘sweating’ the peaches), about 1 hour. In the meantime, prepare the biscuit dough and preheat the oven to 425°F. Combine the flour, baking powder, baking soda, sea salt and sugar in a large bowl. Cut the butter into the flour mixture with a pastry blender or with the tines of a fork. When the butter is incorporated and pea-sized pieces of butter are speckled throughout the flour, add the buttermilk and stir until soft dough is formed. If the dough is very stiff, add additional buttermilk 1 tablespoon at a time until a sticky dough is formed. Turn the dough onto a floured surface and dust liberally with more flour. Knead five or six times, then pat the dough into a round disk 1/2-inch thick. Use a 2 1/2 inch round cutter to cut biscuits from the dough. Lightly spray a 10-inch cast-iron skillet with cooking spray. Add the cornstarch to the peach mixture and stir well until no lumps remain. I didn’t put this in the ingredients list, but a splash of bourbon in the mix never hurts. Add it now if you have it. Pour the mixture into the 10-inch pan. 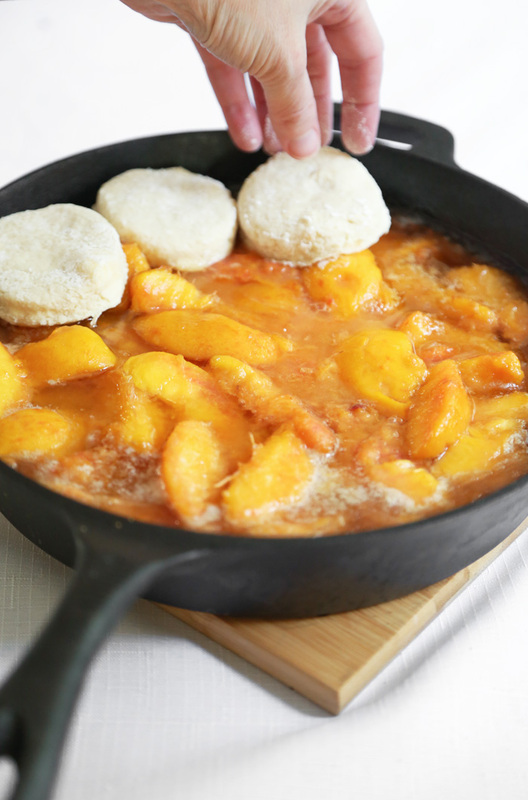 Place biscuits just touching on top of the peaches. You will have some leftover biscuits; you can freeze them between waxed paper or bake them for tomorrow’s breakfast! Sprinkle the biscuits generously with the coarse turbinado sugar. Put the skillet in the oven. 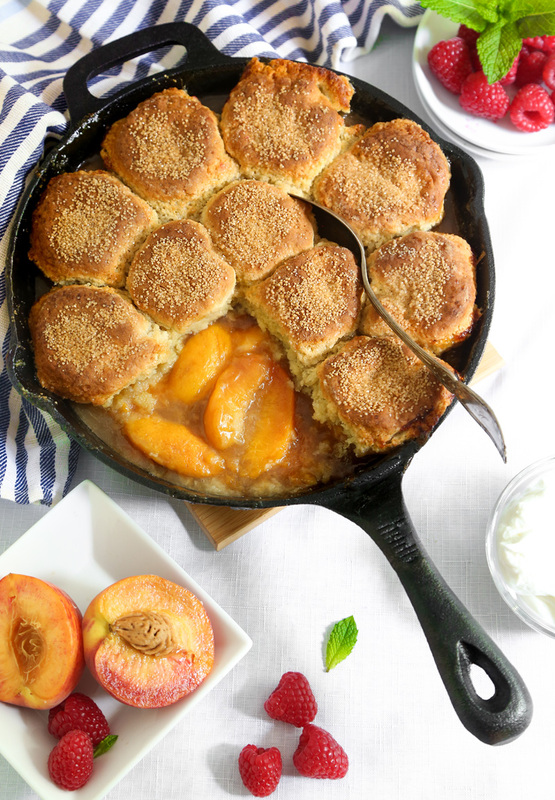 If your peaches are particularly juicy, add a pan underneath the skillet in case some of the filling bubbles over. Bake for 35-40 minutes, or until the biscuits are deep golden brown and baked through the centers. You can check doneness by lifting a center biscuit with a fork to see if it’s done underneath. Add additional bake time if needed. A sheet of foil can be used to cover the biscuits if they seem to be over-browning. Let the cobbler stand about 15 minutes before serving. 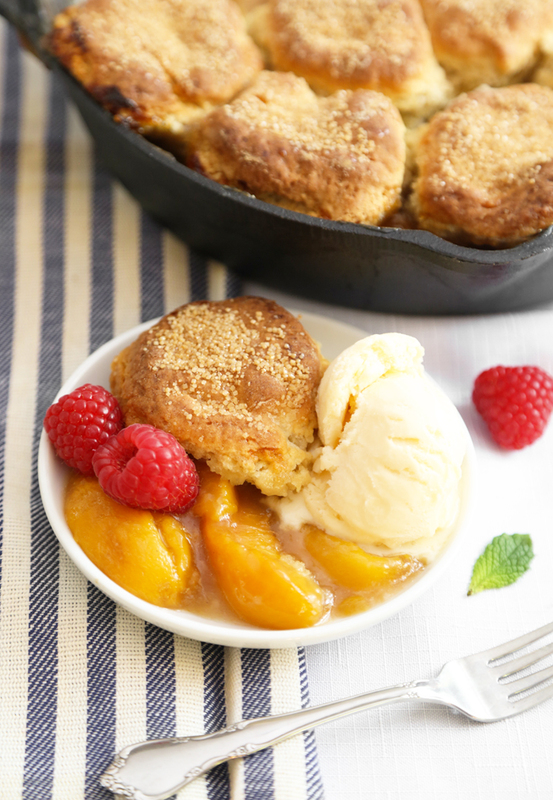 Serve heaping helpings of warm cobbler with scoops ice cream. My mom used to make this. I loved it. Thanks for the reminder. We made this and had leftover biscutis, we made shortcakes with them Thank you. We loved it. My daughter made something like this for her school practical. Got an A for it. Thanks for sharing it. Any thoughts on using cherries with this? I have a ton of cherries but no peaches. I'm thinking increasing the sugar to 1/2c?